UFD Kingston Data Traveler 1GB sudah datang ke alamat saya. Seperti yang saya katakan sebelumnya, special gift itu sekitar jam 10 pagi hari ini datang. Setelah saya buka, isi dari UFD itu sangat menarik sekali, ada sekitar 600 – 700 webtemplate lengkap dengan design yang disertai dengan CSS dan Flash yang berasal dari buku Web Design by Index Content (Agile Rabbit Editions) dan Web Design Index by Content 02 (Agile Rabbit Editions). 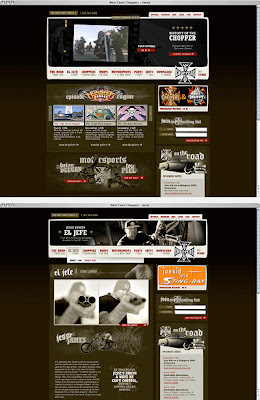 Dibawah ini beberapa screenshoot yang ada dalam webtemplate tsb. Jika anda tertarik dengan web template yang ada pada buku2 tersebut diatas, jangan sungkan-sungkan untuk menghubungi saya. Biayanya tidak mahal, cukup kirimkan Ongkos Kirim + Biaya CD. Berapa banyak produk google yang kita ketahui? Search Engine, Webmaster tools, Blogger, Froogle, Google Earth, Google Maps, Google Desktop, Adsense, Adwords,… yah cuma itu yang saya ingat sewaktu menulis blog ini. Masih banyakkkkk fasilitas yang diberikan. Beberapa bulan lalu saya surfing, dan menemukan produk2 google, dan baru kemarin saya menemukannya lagi di Webmaster Tools. Ok, let’s see the list of google products. Google - The Search Engine. Google Suggest - As you type into the search box, Google Suggest guesses what you’re typing and offers suggestions in real time. Google Trends - Graphically see and compare what the world is searching for. Google Personalized Search - make your search experience more relevant to you. Google Directory - Search the web organized by topic into categories. Google Alerts - sends emails automatically when there are new Google results for your search terms. 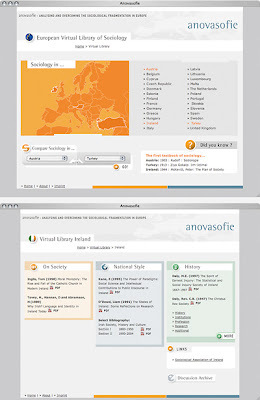 Google Book Search - Search the full text of books (and discover new ones). Google News archive search - provides an easy way to search and explore historical archives. Google Scholar - search for the most relevant research across the world of scholarly research. Google Patent Search - find the full text of the U.S. patent corpus and find patents that interest you. Google Maps - View maps, get driving directions, and search for local businesses and services. Google Public Service Search - offers educational institutions and non-profit organizations worldwide free SiteSearch, which enables users to search your website, and free WebSearch, which enables users to search the Internet. Google’s University Search - enables you to narrow your search to a specific school website for things like admissions information, course schedules, or alumni news. Google Ride Finder - view taxi or shuttle locations in several cities. Google Base - submit all types of online and offline content that is hosted and made searchable online. Google’s Special Searches - enable you to narrow your search to a specific topic. Google AdSense for search - Opportunity to earn money by Google whenever your users click on the targeted Google adsense ads on search results pages. Google Free - provide Google search results to users who want to search the web or just your website. Google Custom Search Engine - Specify the websites that you want searched and integrate the search box and results into your own website. Site-flavored Google search - delivers web search results that are customized to individual websites. Customizable Google Search - you can customize your results display to include background, text and link colors you select. Google Search Appliance - is a hardware and software product designed to offer large businesses the productivity-enhancing power of Google search. Google Desktop - a desktop search application that provides full text search over your email, files, music, photos, chats, Gmail, web pages that you’ve viewed. Google SMS UK - enables you to send queries as text messages from your mobile phone or device and easily get precise answers to your questions. Google Toolbar Beta - Test the latest version on IE. Google Toolbar for Enterprise - provides powerful productivity features including easy access to Google, customized search buttons, instant search suggestions, and a pop-up blocker. Google Browser Buttons - add to a personal toolbar giving you access to Google search technology without taking up extra screen space. CustomizeGoogle - enhances Google search results by adding extra information (like links to Yahoo, Ask Jeeves, MSN etc) and removing unwanted information (like ads and spam). Googlebar Lite - A light-weight Google search toolbar for Firefox. GoogleTabs - Adds a context menu option to open Google search results in tabs. Advanced Dork - Highlight a word or phrase, right click, and choose from over 15 Advanced Google Operators, A google search page is opened in either the same tab or a new tab, the results contained in the search will contain the highlighted text inside the chosen Operator. GooglePreview - Inserts preview images (thumbnails) of web sites and Amazon products into the Google and Yahoo search results pages. Feeling Lucky - Performs Google’s “I’m Feeling Lucky” search with any selected text and opens the result in new a tab. GooglebarL10N - is the localized version of Googlebar with Menues & Texts in German, Italian or Spanish. Google Advanced Operations Toolbar - provides a shortcut to some of Google’s advanced search functions. Search History - View your search history. Google Personal Module. Random Site Image - Displays a random image from a given website (via Google Images site search). Google Personal Module. Google Search Greasemonkey Scripts - use the power of greasemonkey to modify the web. 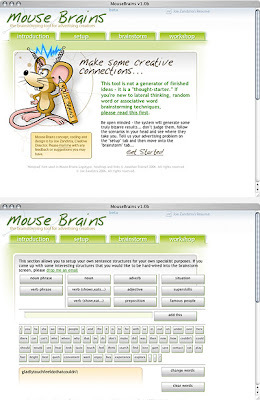 Milly’s Bookmarklets - Bookmarklets that use the Google search engine to search for stuff. Simply Google - search all Google services on one page. Lots of forms. HotDaddy - search all Google services on one page. Lots of icons. Google Total - search all Google services on one page. Drop down menu. GahooYoogle - search multiple Google and Yahoo services together side by side. Twingine - Google and Yahoo search side by side. Babelplex - enables users to search Google’s web index across two languages. Google Current - airs every half hour on Current TV and provides a look at what the world is searching for on Google. Googlewhack - a query consisting of two words (without quotation marks) entered into Google’s search page that returns a single result. Cookin’ With Google - allows you to provide a list of ingredients and get back a list of recipes that Google finds for you. Goofresh - is a way to search for sites added today, yesterday, within the last seven days, or last 30 days. Google Fight - Compare the number of results for two competing keywords. GoogleDuel - a popularity contest using the Google search engine. Random Web Search - it generates a random word, then searches that word on the web using Google. Googlematic - Enables searching of Google via AIM or MSN Messenger. Google Tool - Search multiple google datacenters simultaneously. LostGoggles - adds search site preview images, Amazon pricing, site info links and the Open-in-New-Window-button. Formerly “More Google”. Bukan satu juta komentar yang sudah saya tulis, tetapi komentar saya mendatangkan nominal satu juta rupiah. Kenapa? Saya hanya mengucapkan Selamat Ulang Tahun kepada salah satu Adsenser indonesia, Mas Cosa Aranda, yang berulang tahun pada tanggal 16 Februari lalu. Saat saya memberikan ucapan diblognya (cosaaranda.com), saya sama sekali tidak tahu atau bahkan tidak terlin tas untuk mendapatkan hadiah. Saya merupakan orang yang cukup sering mengunjungi blog tersebut, karena banyak tulisan dan saran yang berisi tentang SEO (Search Engine Optimization), Adsense, Wordpress dan tips-tips lainnya. Pada hari ultahnya, Mas Cosa memposting “Happy Birthday To Me”, dalam posting tersebut hanya terlihat gambar Sapi dengan tulisan Happy Birthday. Ternyata sang empunya memberikan “Hint” yang tidak terlihat oleh kasat mata dan saya sama sekali tidak mengetahuinya. Hanya bisa dilihat jika menekan Ctrl + A, Mas Cosa baru menjelaskan hal ini pada posting “And The Winner Is…”. Hint tersebut memberikan penjelasan bahwa siapa saja yang memberikan komentar pada hari itu dalam posting tersebut (Happy Birthday To Me) akan mendapatkan kesempatan memperoleh hadiah menarik. Pada tanggal 17 Feb kemarin, saya lihat dalam blog tersebut ada posting yang berjudul “And The Winner is…”, Alhamdulillah, nama saya masuk sebagai salah satu yang beruntung mendapatkan hadiah yang sangat menarik itu. Alasannya simple yaitu hanya karena saya komentar pada Jam 16, sesuai dengan tanggal ultah Mas Cosa. by Gunter Beer dan Web Design Index by Content 02 (Agile Rabbit Editions). Salah satu buku tersebut merupakan buku favourite saya jika berkunjung ke Gramedia, maklum karena harganya yang cukup mahal, maka saya hanya membacanya di Gramedia :). Jika dalam nominal rupiah, semuanya tidak kurang dari Satu Juta Rupiah bahkan lebih. Angka yang sangat besar untuk sebuah komentar menurut saya :). Saya sudah konfirmasi dan memberikan alamat lengkap kepada mas Cosa, tinggal tunggu pak DHL mengirim hadiah tersebut kerumah saya. Sekali lagi, terima kasih untuk Mas Cosa. Btw, saya jadi ingat kampanye yang diberikan oleh Arie Putranto, mengenai Kampanye Budayakan Komentar. Jadi, jika anda Blog Walking, jangan segan-segan untuk memberikan komentar sepatah atau dua patah kata mengenai topik yang sedang dibahas, jangan hanya cuma komentar numpang lewat saja :). Baru aja daftar di ReviewMe.com, ternyata blog ini sudah memenuhi syarat yang diberikan, antara lain Alexa Rank dan Technorati Rank, walaupun pas-pasan ternyata di approve juga. Lalu, setelah diapprove harus apa? duduk bengong, liat monitor, check email tunggu orang minta review? dengan cara-cara seperti itu hampir gak mungkin ada orang yang minta review, yang pasti setelah diapprove harus segera mempromosikan diri, atau dengan meningkatkan rangking blog untuk meningkatkan popularitas. Tiap hari adalah hari yang penuh cinta untuk kami berdua, tapi kenapa harus ada hari valentine? Yah, kami memang saling mengucapkan tetapi tidak merayakannya, karena hari2 yang kami lewati semuanya adalah hari "Valentine". Pada hari ini juga Ibu saya tercinta berulang tahun, kami sekeluarga baru rencana akan merayakannya pada hari Sabtu nanti, cuma sekedar keluar untuk makan-makan bersama. Baca tips dari mas Cosa, jadi mau mempraktekannya. Agar lebih cepat dicrawl SE, saya taruh link2 tersebut dalam blog ini. Beberapa link ini adalah Profile dan Reader yang saya arahkan untuk backlink :), mudah2an berhasil. Abis baca posting Pak Budi Putra mengenai Cara Gratis Promosi Blog, langsung ingat technorati, saya coba check berapa orang yang sudah memasukan blog saya kedalam blogroll mereka? ternyata hanya 14 orang. Sedikit sekali bukan. Ini mungkin karena saya tidak pernah aktif untuk menawarkan saling bertukar blog dalam blogroll seperti kawan2 blogger yang lainnya. Akhirnya saya membuka salah satu blog agregator planet.terasi.net, kebetulan juga blog saya ada disana. Dengan tanpa malu dan tanpa ijin dari pemiliknya, Ronny Haryanto, saya mengcopy seluruh blogger yang ada dalam aggregator tersebut kedalam blog saya. Mudah-mudahan mas Ronny tidak keberatan, tetapi jika keberatan saya pasti akan melepasnya kembali dan hanya memasukan blogroll yang ada dalam technorati. Banyak e-book dan forum yang memberikan tips-tips untuk Adsense dan SEO, tapi apakah semuanya mudah untuk dimengerti, menurut saya ada beberapa yang bisa dimengerti dan mudah dilaksanakan, sisanya hanya omong kosong dan tidak semuanya bisa kita dapatkan dengan gratis. Forum-forum dan e-book yang tersedia juga hampir 100persen dengan bahasa inggris, untuk saya yang mempunyai keahlian pas-pasan untuk inggris perlu kerja extra untuk mentranslatenya menjadi lebih mudah dimengerti. Yang saya tau, forum yang banyak untuk membahas kedua hal tersebut diatas yang dalam bahasa indonesia hanya adsense-id, forumnya para pahlawan devisa negara, tetapi jika anda ingin berkonsultasi mengenai Adsense dan SEO, saya sarankan untuk menemui Mas Cosa, sampai saat ini dia selalu memberikan tips2 yang tokcer untuk masalah SEO dan Adsense. Jika anda punya masalah, silahkan hubungi pakarnya melalui cosaaranda.com, dan tentu saja semuanya gratis. 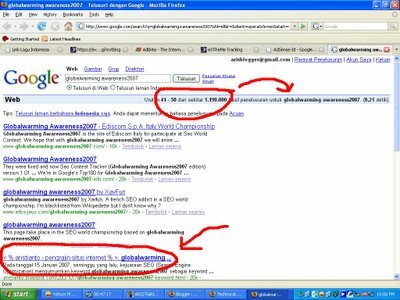 Saya baru check comment dari post saya mengenai SEO Contest pada posting Globalwarming Awareness2007 keyword, ada seorang peserta lagi dari indonesia yang mengikuti kontest tersebut. Dengan domain http://globalwarmingawareness2007-mes.com/, mas miskandar juga ikut bertempur seluruh peserta dari dunia dengan mengandalkan keyword globalwarming awareness2007, untuk websitenya. Semoga saja mas Miskandar bisa menunjukan giginya seperti situs warmingtoday.com yang sudah memasuki peringkat 10 Besar. 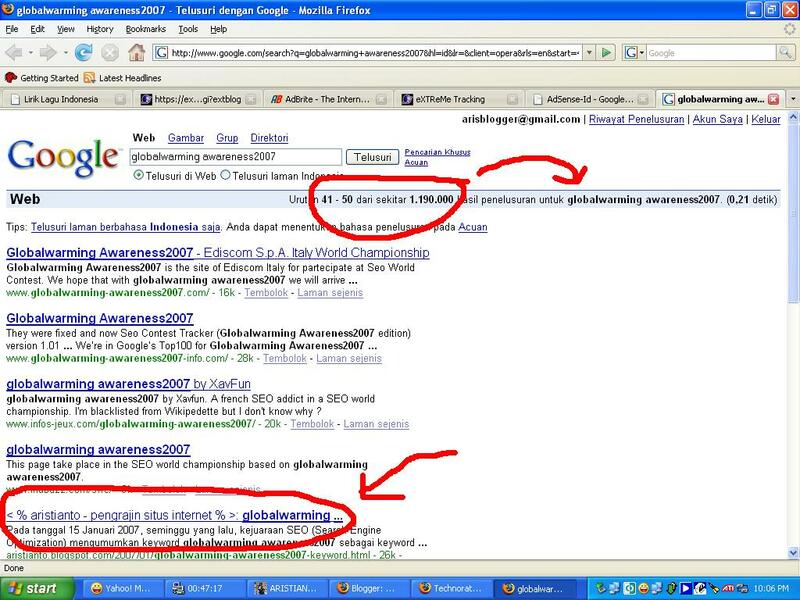 Btw, blog saya ini juga masuk dalam index google pada urutan 45 dari 1.190.00 search query, SEP (Search Engine Page) 5.